I have a business, or company if you will. I realize a company is in business to make money and the more it makes, the more it will grow. I also realize my company will never grow enough to be a “big” business, and that’s okay with me. I realize this because I have experience working for small, medium, and large companies. In fact, when not working in my own company, I am currently working a W-2 job for a large company and I know that large company doesn’t give a damn about me, my feelings, or my family. They have proven that to me many times. Oh they pretend, and they go as far as producing propaganda proudly explaining how they care about their employees, but I’m intelligent enough to know they really don’t care about me (or any other employee) personally. That’s why I know I’ll never run a large company; I care too much about people. I recently changed my LinkedIn Profile Summary to this – “Everything I do is to help people get through life a little easier…” Feel free to go to my LinkedIn page to read the rest. My point that I wanted to say here is that I (individually) and WE (as a company) do whatever we can to help as many people as we can, in many different ways. That has always been and will always be my personal philosophy in my life and work. I think this world is difficult enough to get through. If I can help someone make it from one moment to the next a little happier, a little less stressed, a little more knowledgeable, or maybe even grateful just to make it to that next moment, I’ll be happy. If I can take them even beyond the one moment, that would even be better. That’s why I do what some people consider weird abstract art. My purpose is to make it weird enough for you to look at it longer to try to figure out, but pleasurable enough to enjoy it for as long as possible. We now buy houses and apartments to help people. We started that to help people going through difficult financial times so we could help them before the bank just takes their house from them. We buy houses and apartments so we can help people by offering more affordable housing than someone might find in that same area, or maybe better amenities for a better price. We also make things and resell donated or discounted things we’ve purchased in an attempt to raise money to use to buy things that people need, or just give cash directly to people if that is needed more. We may start a non-profit or foundation someday, but we don’t want red tape or administrative costs getting in the way or reducing the giving. If you know anyone who needs help in any way, please either tell them to get in touch with us or let us know about them. Preferably the latter, because most people don’t want to ask strangers for help. Put simply – A Ty Team Scout is someone who scouts properties for Ty Team Holdings to buy. Ty Team Holdings LLC buys houses in Massachusetts and New Hampshire. We prefer to help people who need to get out of a mortgage (for whatever reason) before the bank takes their house from them, but we understand the difficulty of admitting such a circumstance and then doing something about it before it’s too late. We know because we’ve been there. Besides a need to get out of a mortgage, some people just want to sell their house and move somewhere else. We also buy those houses, and we pay a fair price competitive in the market without the need to repair, clean, or pay fees and other typical expenses. We are a small, “Mom & Pop” team, so no matter which way someone wants to sell a house, we hire scouts to help us find them. We compensate scouts in various ways such as with cash, gift cards, or bartered services. If you would like to be a scout for us and make some fast, easy money without working hard for it, contact us for more details. We pay up to $500 cash for a property. Anyone who brings us a deal we purchase is eligible to collect this if agreed on in advance. That means even a home owner could get a $500 cash discount at closing just by selling us their house. To apply or hear more, call or send a note. I used to hate that I can’t lie. Really. It used to piss me off being so damn honest. But eventually, I gave up and just got used to it. Oh, I can joke, fib (with a laugh), and tell a fictional story, but when it comes right down to truth or non-truth, truth always wins out with me; just like fairness. Truth and fairness are a couple moral traits I have. I have also been told I am sort of smart, at least compared to some people. I don’t really agree with that, but I will admit that I am at least smart enough to know this truth - God has put me here to help those who need my help. God has given me certain talents and abilities to use for helping people. Besides an analytical mind, I have what is known as a kind heart. I am not bragging, I don’t even like to admit it, but it is there and I don’t lie. I’m not going to explain all the details and tell you the whole story right now, nobody has time for that. What I wanted to tell you is that one of the ways I help others now is by helping people who are having financial difficulties and want or need to get out of a mortgage they no longer want to be in. I can help with that. I can help people with financial difficulties because I have had them myself and I have learned what to do. I am smart enough to figure some things out, I am truthful enough to share what I have learned, and I am fair enough to give the information to anyone who wants it. I am here to help whomever needs me. Is that you? I don’t know without you telling me. All you have to do is tell me some things and ask for my help. I am a messenger of God, but I am not a mind reader. I don’t know you need my help unless you tell me. If I am able, I will help you. With the help of a team, I started a business to help people called Ty Team Holdings LLC. It is a company that does residential rehabilitation and rentals. We purchase houses from people who need (or want) to get out of a mortgage. We PAY CASH FOR HOUSES, CLOSE QUICKLY so people can get on with life without stress, and we SAVE THEM the costs of selling their house. If needed, we fix the house up and resell it or we rent to people who can’t afford to buy. Do we make money? We will someday, but honestly, not yet (as of this writing). Being a business, we hope to make money so we can use it for good. As soon as we are able, we will be giving a portion of our profits back to help people in need, which could end up being the very people we are buying a house from or renting one to (you never know). We would appreciate you spreading the word and letting people know about us if you know anyone who may need us so we can get on with our mission of helping others quicker. This is a great book for beginners, or “newbies” to the flipping business. I’d say it’s even got some good, helpful info for the intermediate flipper. If you are already experience and have been doing it for 5 years or more, I would hope you already know the information in it. There are some aspects to flipping that might be easy for certain people, but there are many pieces to building a business of flipping houses, from setting up an entity to marketing, to exact steps in how to rehab a house, to selling it, to dealing with tax issues. This book covers it all in an easy to read format. It has lots of great info and makes you feel motivated and ready by the time you’re done with it (or before you are done). You know how you watch videos or listen to podcasts about real estate investing or flipping houses and the person offers the disclaimer, “I’m not a lawyer, so you should seek legal advice before believing what I’m telling you?” Well, Bill Bronchick IS a lawyer, so he doesn’t give you the disclaimer, he gives you the good, legal advice. I loved all the legal stuff and especially all the samples in the appendixes from business cards, to emails, to contracts, to marketing materials, to foreclosure information by state. Very helpful info! If you are new or just considering getting into house flipping, do not hesitate, just buy it. If you’ve been doing it for a while, you still may want to look at it to see if you can learn something. Ty's Disclaimer: I did not get paid for this review and did not get a free copy of the book to review. I purchased it with my own hard-earned money (and am happy I did). So you bought a home a long time ago and now, for whatever reason, you’re thinking about selling it and wondering what’s involved. You’re wondering how much of a hassle it’s going to be (stress and time) and how much it’s going to cost you to sell it. That’s right, even though you are selling, there is a cost. The higher that cost is, the more it will eat into your profit. 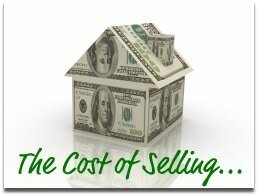 ​Below are a few of the costs that could go into selling your house. Although commissions can sometimes be negotiated, they usually range from 6 to 10%. That’s right, I know one agent in Massachusetts that charges 10% to sell your house. Let’s say you find a normal one and only have to pay 6% commission. As of February 2017, the average house in Massachusetts is selling for $365,000. If you had that average house selling for that, you would right away hand over $21,900 to the realtor. That alone is why some people try selling their house without an agent. You have to weigh all the factors and I’m not going to get into whether or not that is a good idea with this post. You might have been putting off doing some work on the house and would need to get certain things done if you want to sell it. Some repairs might be minor, some might be major and costly. At the very least, you should do some minor “fix up” things such as painting, changing cabinet knobs, fixing leaky faucets, tightening things, de-cluttering and cleaning, minor landscaping. If there are major repairs to do, you could always try offering a discount for it instead of doing the repair. Sometimes it’s better to just fix it, sometimes it’s better to wait and see if the buyer notices; it all depends on what it is and how major it is. I think a good average to plan for can run anywhere from $1,000 to $20,000, depending on the extent of the repairs and value of the property. This may vary depending on the type of loan, the bank, and the loan amount. Some mortgages have a prepayment penalty, some will have prorated interest until the closing day. Any neighborhood fees such as HOA or transfer taxes. Capital gains taxes if you make a profit by selling your home. Currently, long term capital gains depend on your tax bracket, but usually range from 15 to 20%. So IF you made a profit of $100,000 after all these expenses mentioned, you would be giving $20,000 of that back to the IRS for taxes. Besides gains tax, you may also have to pay property taxes, depending on when you sell. A home warranty for potential buyers is an optional expense, but sometimes helps sell a house. If you get one, that could add another $500 to the selling cost. You may need a termite inspection and fix, fire inspection and new alarms, and things like that. You may have to pay some or all of the closing costs, depending on the negotiation. There’s moving and/or cleanout costs, which will depend on how much stuff you have, how much you want to keep, and how far you have to move it. There’s the costs of purchasing a new home or even renting if you have to pay first and last month’s rent, a security deposit, application fee, HOA fees, etc. To sum it all up, the average cost to sell a house is usually between 30% to 50% when you factor in everything. That means after all that trouble, all that time, all that hassle and headache, and phone calls, and cleaning, and repairing, and taxes, you’re only going to end up with half the amount. Is it really worth it? That's why real estate investors like Ty Team Holdings have become so popular. Ty Team Holdings can take a lot of the hassle, stress, and time out of selling your house. You may not get the full amount for your house that a realtor would list it for, but there’s no guarantee that you would get that amount anyway, it’s just a listed amount and a hope. You might actually get more using Ty Team Holdings than what you would get after all the typical costs. If you sell your house to a real estate company such as Ty Team Holdings, you would get a price that you would be happy with and a quicker, stress free closing. That’s right, you can close on your schedule, whenever you want and GET CASH within days. WE BUY HOUSES AS IS. WE BUY HOUSE with NO FEES. WE BUY HOUSES WITH NO REPAIRS NEEDED. Sell your house with NO STRESS. It’s a whole new way of selling your house. Sell your house with no costs, commissions, fees, or taxes mentioned above. We pay cash for your house that you need fast. There is no need to repair or clean anything. We’ll buy your house just like it is. You can even leave whatever stuff you don’t want anymore. Just move what you want, and leave the rest behind with your stress. To sum up your solution: You will get a price you are happy with for your house without fixing or cleaning anything (or you don’t have to sell it). You get cash – and fast. You pick when to close – and WE pay all the closing costs. You move only what you want and leave anything else, including all your trash. If you want, we could even help you move. If this sounds like an interesting solution to you, CONTACT US now to find out more. Call 978-206-1074 or Email mail (at) tyteamholdings.com.